I've long been a fan of Freewheelin' Community Bikes. 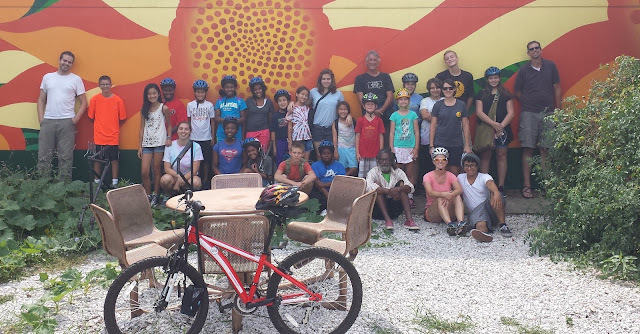 It's a wonderful organization that educates youth about bike safety and maintenance, while creating a vibrant community center for the Mapleton Fallcreek Neighborhood and larger Indianapolis community. 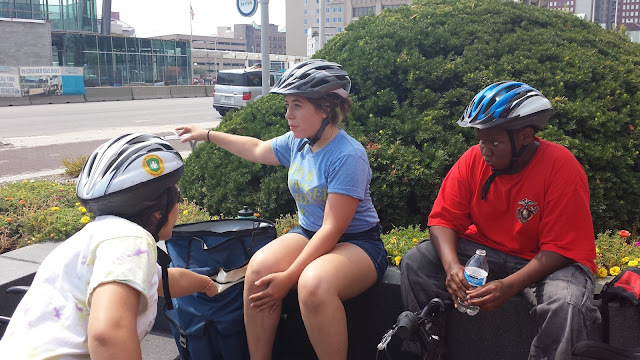 Freewheelin' also empowers youth to leadership positions within the organization. Among other initiatives, Freewheelin' takes kids through an Earn-A-Bike Program where kids work with Freewheelin' mentors to learn all about bicycles, earning different colored aprons (a la the martial arts) as they gain mastery of all aspects of this healthy activity — healthy for the individual and for the planet. 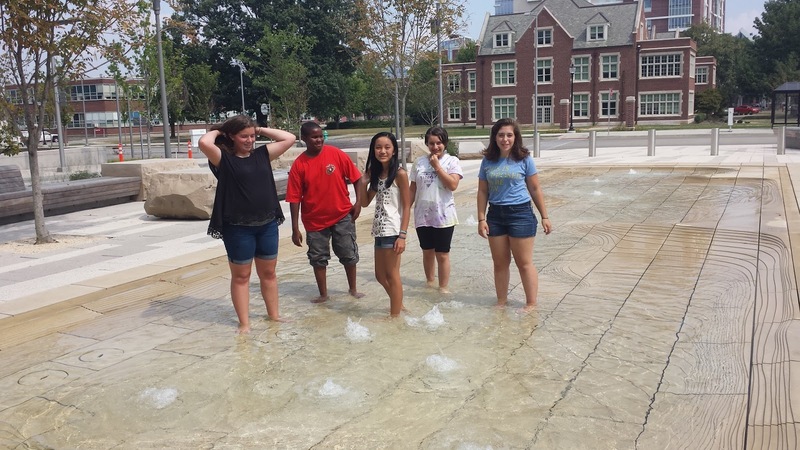 Freewheelin' is a natural partner for our work at Earth Charter Indiana and Youth Power Indiana, and our shared interest in empowering youth and building self resiliency. And so it was a perfect fit for our most recent Climate Camp day camp. 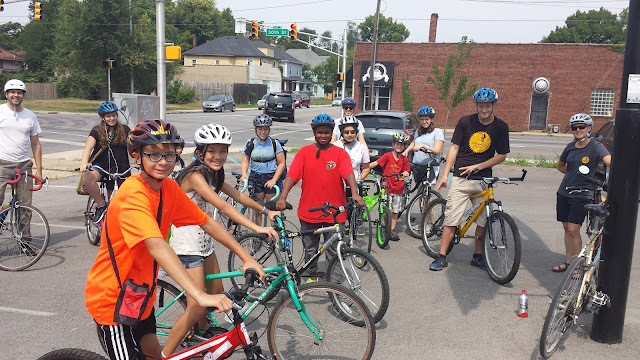 We ended up with 20 youth, ages 8-17, from numerous areas around Indianapolis. 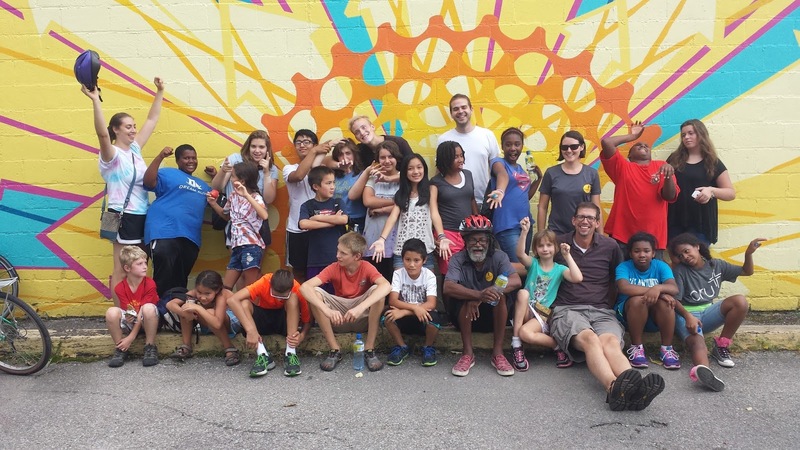 We spent the morning learning bike safety and maintenance, then I showed a brief presentation on climate change during lunch, detailing how bikes are a meaningful antidote to the carbon pollution emitted from cars. We calculated the pounds of carbon we would in fact save that afternoon as we broke up into two groups and two different destinations. The overwhelming conclusion: Choose bikes! As usual in my blog, I'll let the pictures do the story telling. 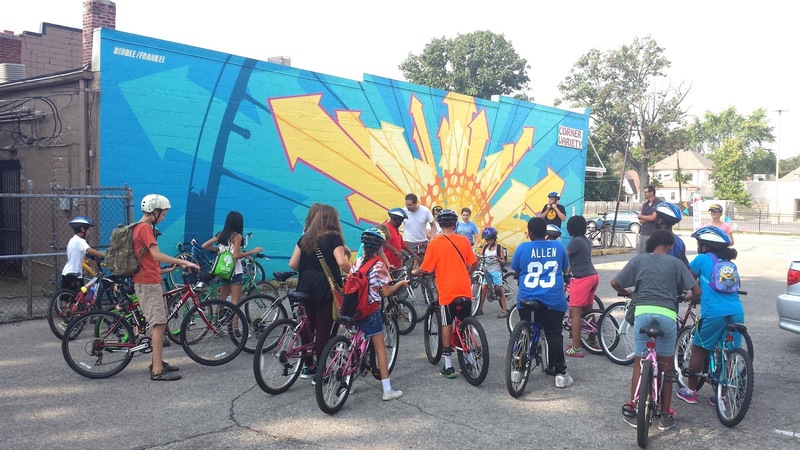 In the morning, Freewheelin' led us through a bicycle workshop. 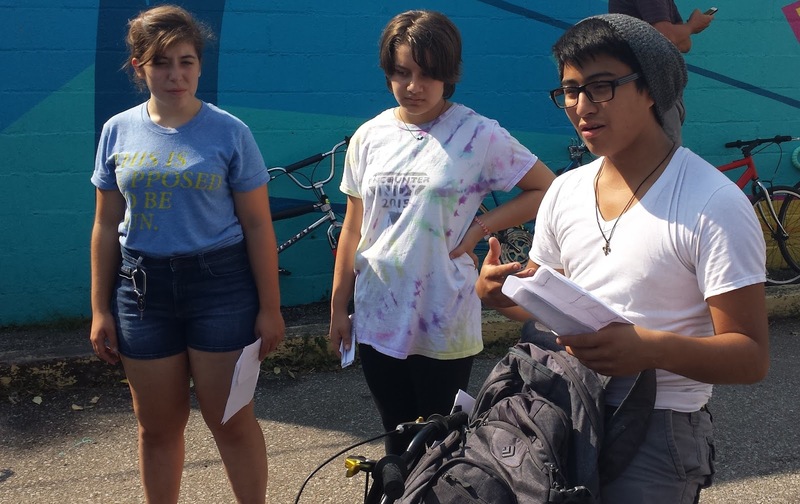 These three youth are veterans of the Freewheelin' program and instructed our Climate Campers. After the workshop, we ate at Unleavened Bread Cafe. Here we are after lunch at the adjacent Fall Creek Gardens, an exemplary community garden. We broke up into two different groups that afternoon. Our group was headed to Eskenazi, a regular destination for Climate Camp, to observe the Skyfarm and other sustainable practices. Our group actually broke into two sub groups for further safety considerations. The second group ended up at another Climate Camp favorite, White Pine Wilderness Academy. On the way to Eskenazi, Kat talked with our group about the Cultural Trail and how to be good and responsible cyclers. 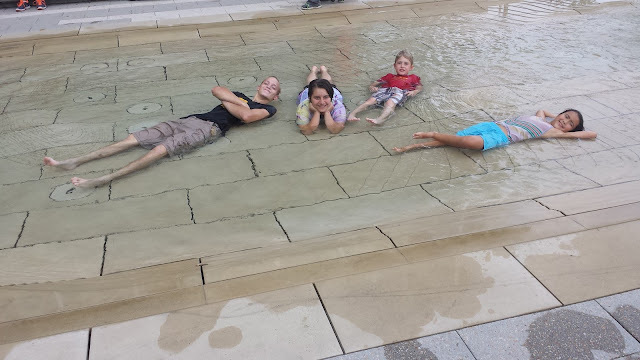 We enjoyed the Commons outside Eskenazi, cooling down after a hot ride. Carter was happy to get wet after our long ride. Cora (left) led campers through a food exercise that assesses the carbon footprint of food choices. 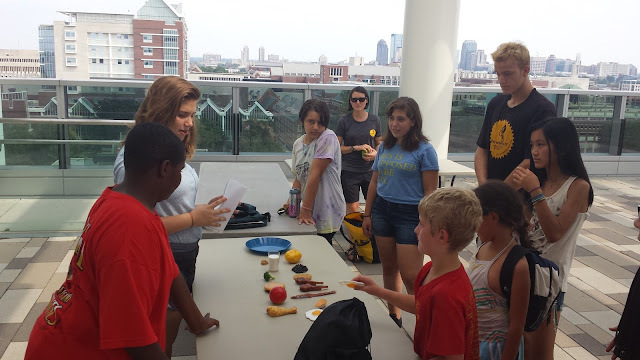 The Skyfarm, on top of Eskenazi, is a perfect place to talk about food miles! 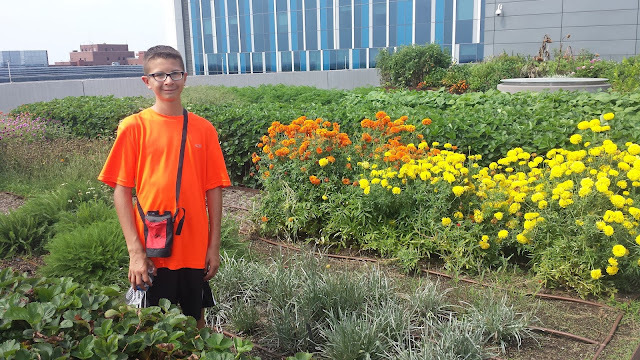 Thomas blended right in with flower garden on the Skyfarm. Some of our campers got good and wet before the long ride back to Freewheelin'. 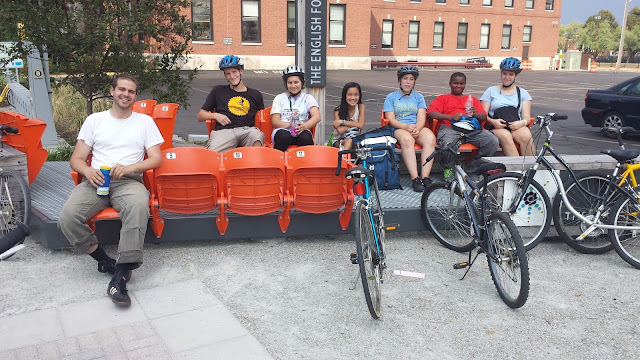 On the way home, we took a break along the Cultural Trail. 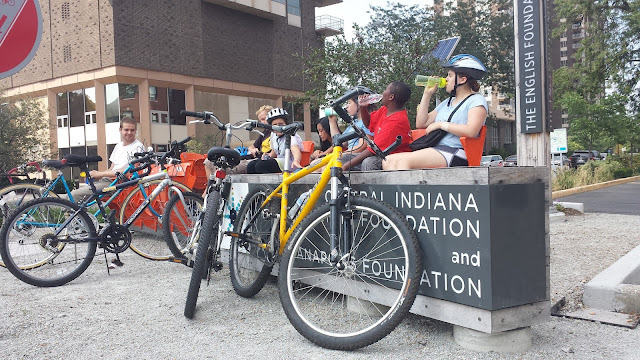 This was a meaningful stop to me, because Indianapolis Foundation, a CICF affiliate, is helping to fund our Climate Camp day camps, so this was a prefect place to rest and be grateful. 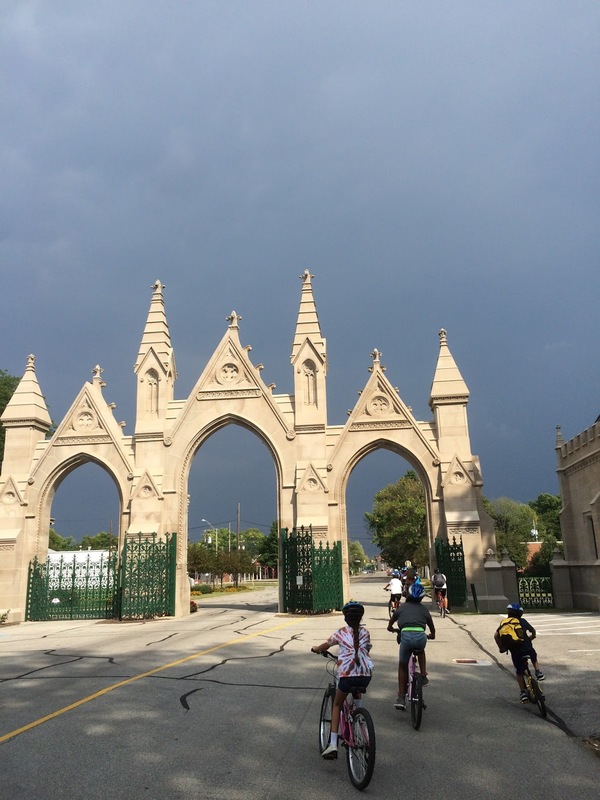 Meanwhile the other group was coming back to Freewheelin' via Crown Hill Cemetery. Thanks to Jerome Delbridge who volunteered that day and shot this photo — and the White Pine one, too. A happy crew at the end of the day. As it turns out, the White Pine group logged about 9 miles, while the Eskenazi group rode a bit over 12 miles. 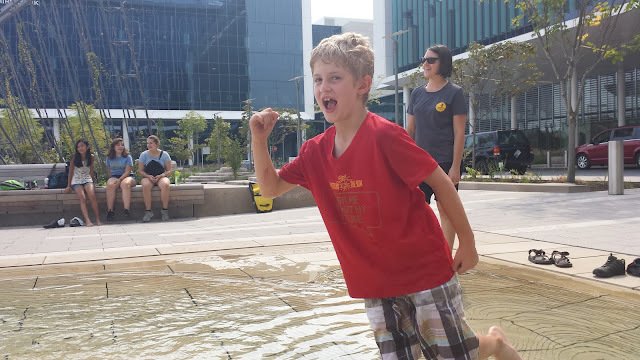 Some of the kids were tired by the end, but thankfully, everyone along the way — cars, other cyclers, and also pedestrians — was nice, and their were no injuries or mishaps to report. Some of the Climate Campers are excited to join the Freewheelin' Earn a Bike Program. Classes begin Oct. 10! I believe our shared commitment to youth empowerment means this camp was the beginning of numerous collaborations. Bikes create opportunities for fitness, resiliency, carbon pollution reduction and community leadership. Thanks to Freewheelin' and the wonderful adult and youth volunteers who made this an extraordinary Climate Camp! 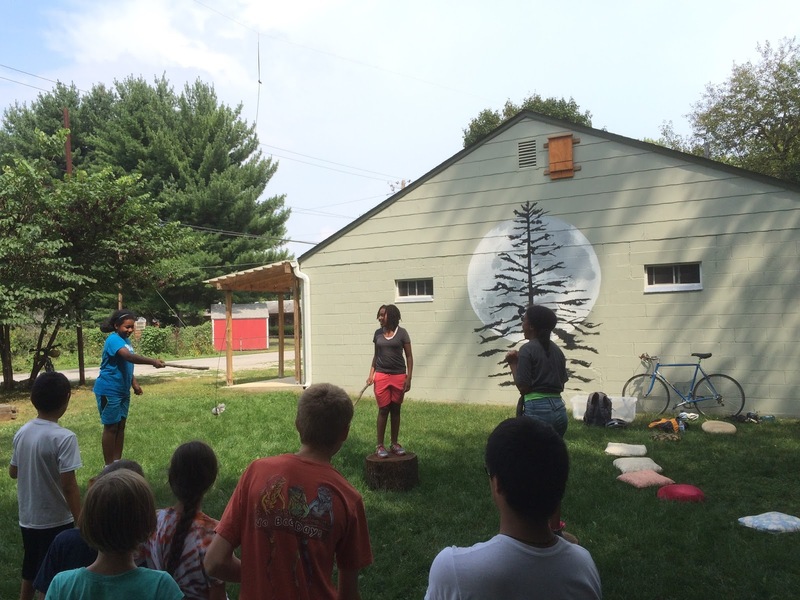 For more on Climate Camp and to learn about our next camp, tentatively scheduled for the second week of October, email me or message me via this blog. And keep on riding! Beautiful experience! Thanks for the photos. mainly Public sell a few different baby seat options with their bikes: seats that go on the handle bars and seats that go on the back. I'm not really keen on having Lola on the handle bars. We spent the morning learning bike safety and maintenance, then I showed a brief presentation on climate change during lunch, detailing how bikes are a meaningful antidote to the carbon pollution emitted from cars.